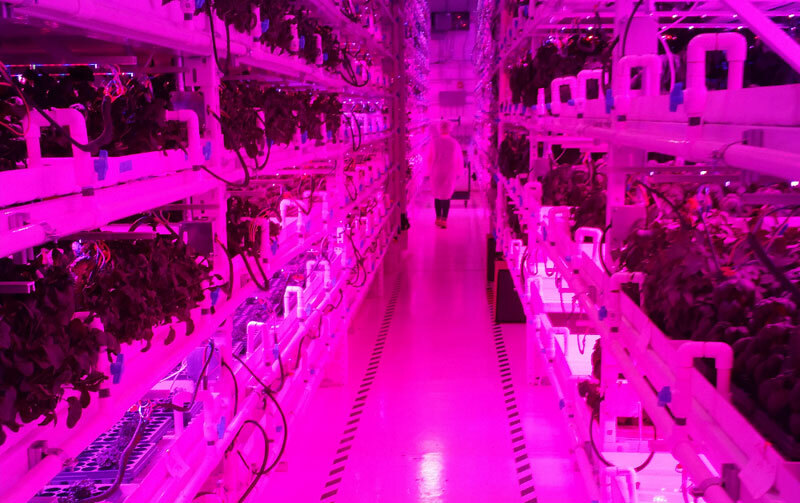 Infinite Harvest, an indoor vertical farm in Lakewood, Colorado, provides a glimpse into the future of global large-scale food production. Inside Infinite Harvest's 5,400 square-foot grow facility in Lakewood, Colorado. Romano’s duties included test engineering, satellite operations, ground station development and operations, control system design and data analysis – in other words, he helped develop ways to help keep humans alive and healthy in outer space. These days, however, he’s using his knowledge of space-habitat design to advance food systems right here on Earth. So, what do astronauts and arugula have in common? They both need the same things to live. Romano’s operation, Infinite Harvest uses similar technology and philosophies to those used on the space station – only on terra firma. Just as every aspect of space-station operations are monitored closely by automated systems, so are Infinite Harvest’s leafy greens. By now, you’ve probably heard about vertical farms and the many advantages this way of growing has over open farming. Vertical farming can be done all year long in urban environments with no lulls in food production. Floods, droughts, hail, and pests aren’t issues because everything about the plants’ environment – temperature, light, food, humidity, water – is meticulously controlled. Since there are no pests, there’s no need for pesticides and herbicides, and no harmful runoff. Perhaps most importantly, vertical farming requires a fraction of the arable land and water used in traditional farming – a key factor in Colorado, whose population continues to grow rapidly even as the West continues to experience mega-droughts”‹. Not everyone is a fan of vertical farming, though. For thousands of years, farming meant getting down and dirty – literally. Some critics say vertical farming just isn’t the “real” thing. At Infinite Harvest’s 5,400 square-foot grow facility in Lakewood, Colorado, Romano oversees a team of ten greenhouse technicians who manage planting, harvesting, packing, and delivery. Baby kale, arugula, microgreens, and two varieties of basil (Thai and Genovese) grow in neatly-stacked trays that tower to the warehouse ceiling. A neon, pinkish-purple hue – LED lights designed by Romano – bathes the lush vegetation in other-wordly light. Roughly 160,000 plants, in various stages of development, are growing at any given time. Here in this completely man-made environment, plants may never see natural sunlight until they’re loaded onto a truck on delivery day. So, where does all this food go? Romano’s clients include celebrity chefs, upscale eateries, and prominent restaurant groups. Infinite Harvest sells exclusively to mid and high-level restaurants in the Denver metro area, including Rioja (the flagship restaurant of James Beard award winner Jennifer Jasinski) and Beast + Bottle, owned by renowned chef Paul C. Reilly. Not only does indoor farming provide a steady supply of sustainable food for the Mile High City’s epicureans, it allows Romano to customize flavor profiles according to a chef’s specific request. For example, young arugula is sweeter. But if you grow it longer and change certain growing conditions, such as light exposure and nutrient levels, it tastes more peppery. Restaurants want this variety according to which dish the produce will be used in, or simply due to the taste preference of the chef. Here in this completely man-made environment, plants may never see natural sunlight until they’re loaded onto a truck on delivery day. Infinite Harvest has a 50-mile limit for delivery, but Romano says all his current clients are within half that distance. Rarely does his delivery team venture outside downtown Denver, and harvest-to-table time is measured in hours, not days or weeks. Despite his set-up’s advantages, Romano admits it’s not without its share of difficulties. One: logistics, he says. Two: Market demand. Because Colorado has a short outdoor growing season, chefs have clamored for the opportunity to purchase Infinite Harvest’s produce since they began limited operations in March 2015. “The response from the local market for our product was extremely high,” Romano says. That left some frustrated chefs waiting up to six months to receive their first orders. 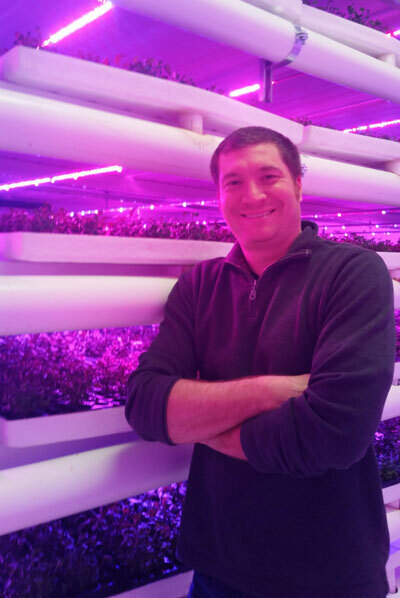 Romano secured a second round of funding from investors quickly after the company’s first harvest last March, which he used to complete construction a full year ahead of schedule. Although Romano’s aerospace engineering background allows him to look at food production through a scientific lens, he is, first and foremost, a realist.